"In what has become a landmark of American history and literature, Incidents in the Life of a Slave Girl recounts the incredible but true story of Harriet Jacobs, born a slave in North Carolina in 1813. Her tale gains its importance from her descriptions, in great and painful detail, of the sexual exploitation that daily haunted her life—and the life of every other black female slave. As a child, Harriet Jacobs remained blissfully unaware that she was a slave until the deaths of both her mother and a benevolent mistress exposed her to a sexually predatory master, Dr. Flint. Determined to escape, she spends seven years hidden away in a garret in her grandmother’s house, three feet high at its tallest point, with almost no air or light, and with only glimpses of her children to sustain her courage. In the face of seemingly insurmountable odds, she finally wins her battle for freedom by escaping to the North in 1842. A powerful, unflinching portrayal of the brutality of slave life, Incidents in the Life of a Slave Girl stands alongside Frederick Douglass’s classic autobiographies as one of the most significant slave narratives ever written." 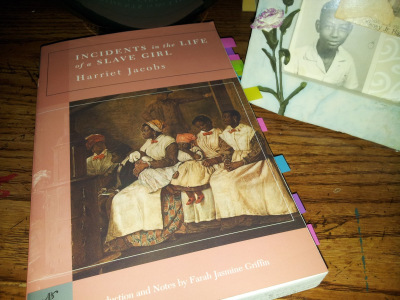 I tried to think up the right approach to writing my thoughts on Harriet Jacobs’ Incidents in the Life of a Slave Girl. The multitude of topic threads available to weave seems… well… endless. Should I even try to stretch each thread out, I don’t believe I’ll ever get anything sown. Which will leave me further procrastinating the creation of a post. Nonetheless, as a slave narrative/autobiography, the book takes readers through Jacob’s courageous experience growing up a slave in North Carolina. Her intimate voice recounts years underneath the thumb of the obsessive and suffocating father of her adolescent owner. (By rights and a will, Jacobs became the property of a young girl.) As well as the complications she faces crafting (though severely daring and frightening) her escape to New York. How she managed to survive her story is almost unbelievable. Epic and mind-blowing–if you will. I won't spoil it, but just the thought of her measures gives me phantom pains synonymous with osteoarthritis symptoms. Still, given the era and desperation of our ancestors, I can picture and welcome such extremes clearly. As a slave narrative, Incidents serves the traditional makeup within this area of African-American literature. The familiar conversations on abolitionism and humanitarianism takes much of the lead. Followed shortly by the wind of Christian beliefs slaves shielded the violence and horror of racial oppression from. Or attempted to, anyway. On the same Christian token, it also give parallels to the religious hypocrisy slave owners proposed to reason with their actions. (A disgusting thought that turns my stomach each time some slave owner attributes God’s will to shackling a race to harvest tobacco.) Tie in the book’s footnotes illuminating historical facts/events; Incidents dances into each of the familiar slave narrative elements without missing a beat regarding its purpose. And yet, there’s something entirely different and unique about the book. On the surface, it’s the story of the lengths an enslaved woman will take to hold on to her family in a world designed to rip her from them for profit. Which is where the sympathetic edge to her slave narrative lie. And I mention that because slave narratives’ primary focus was to create awareness, via the intimate streams of blunt and dark realities individuals faced within this grotesque system. And Jacobs served on all fronts. But so much aside, I really found Incidents in the Life of a Slave Girl a critical and necessary read. And one where I’d like to answer the discussion questions provided by the book in the third half of this post. However, before, I want to add a few of my favorite quotes/passages in the second half.